This is ultimately a lazy and broke college student’s dream Chinese takeout dish. Of course, with a much healthier as well as a veganized twist! My mother and father have been genuinely concerned with my diet lately, and it’s because they fear of my “excess” soy consumption! I am no way saying that there is no reason for them to worry, because I kind of have to agree! As of now I’ve been eating soy probably 2-3 times a day, ONCE at the least. Obviously, this is usually in the form of organic non-GMO firm tofu, tempeh or edamame, but I do love my sneaky protein TVP oatmeal and vegan patties as well. But hey, according to my research, I am safe so as long as I don’t exceed five daily servings, which I think is pretty ridiculous to fit in unless if you are SERIOUSLY smashing in the soy. If you want a more in-depth post about my take on soy, feel free to comment so after reading this post! On the contrary, I do think that it’s not very wise of me to rely on soy as a main source of protein, right? My diet should consist of a diversity of whole, plant-based foods with a vast array of nutrients. So I’ve been experimenting with lentils, black beans, chickpeas, brown rice, even just upping my vegetable intake–broccoli, artichokes, cauliflower, spinach and kale–in order to make sure that I feel satisfied and energized after all of my meals. 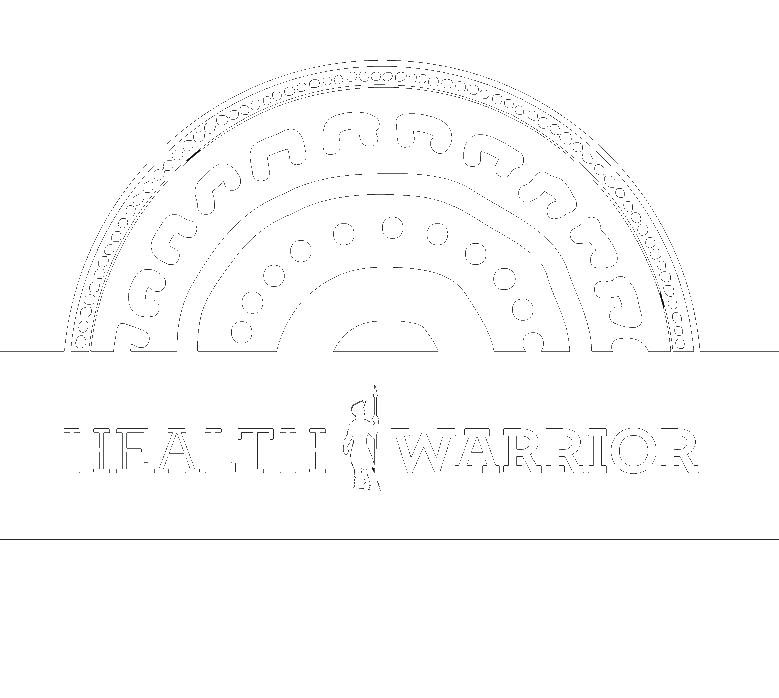 Like I said in my diet updates post several months ago, I find that too much protein can make me feel fatigued and sluggish, but that applies to fat and carbs as well. But back to soy: even though it shouldn’t be the ONLY thing I eat, that doesn’t mean I can never enjoy it. In fact, I will continue to use organic, non-GMO tofu as a staple in my kitchen, when I leave for college, and when I find my own place to reside in. That being said, this recipe is simple. EMBARRASSINGLY simple. There are literally only seven ingredients that you will need. However, given that I am a college student living on a tight budget and time schedule, these kinds of recipes are going to be used on the daily. Might as well get some preparation and practice, shall we? And as a fun little bonus, we are going to be taking this recipe to the more oriental route in which the flavors are inspired by the black pepper stir-fry dishes of China! Black pepper stir-fry dishes, however, usually require that you own three different kinds of soy sauce: sweet, light, and dark. To be honest, I did NOT have sweet soy sauce, hence why I added the coconut sugar to provide a small kick of sweetness. Now how’s that for a ridiculously broke and panicky college student? Opt: sea salt, chili flakes, green onions, other vegetables, etc. Drain your block of tofu and cover with paper towels on a cutting board. Gently use a baking tray or some kind of weight block to completely press the water out of the tofu. Cut the tofu into cubes. Set aside. Chop the onion and broccoli in even pieces. Set aside. In a rice cooker or steamer, gently heat the broccoli until slightly soft. Meanwhile, in a nonstick wok pan, heat the garlic and onions with a little bit of water, olive oil or coconut oil if necessary. Stir everything until the onions are translucent. Mix in the tofu, sauces and coconut sugar evenly until fragrant. Season with salt and (LOTS of) pepper to taste. 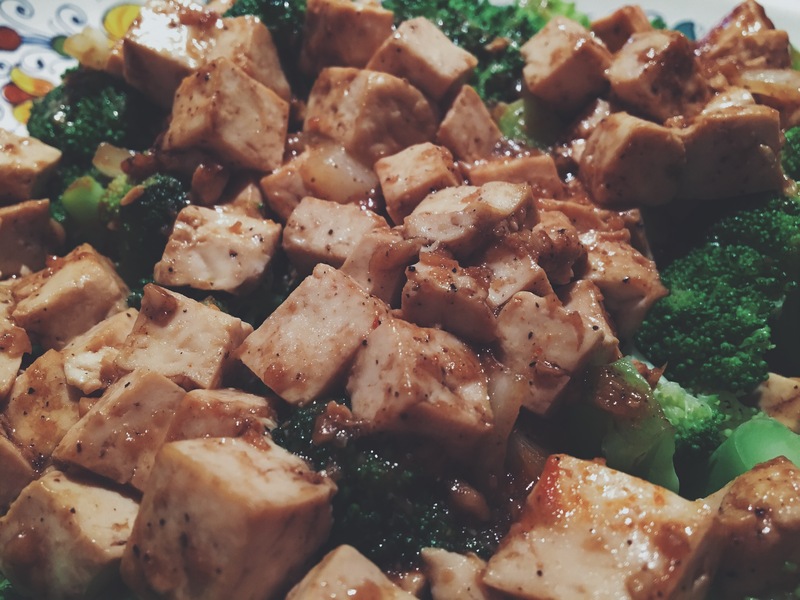 When ready, serve the black pepper tofu with the broccoli as desired: you can use brown rice, whole grain noodles, or even cauliflower rice! Do you eat so much of one thing that it’s concerning? What is your favorite Chinese dish? Wow, this looks so yummy! I made a similar stir-fry tonight for my family, but with chicken instead. 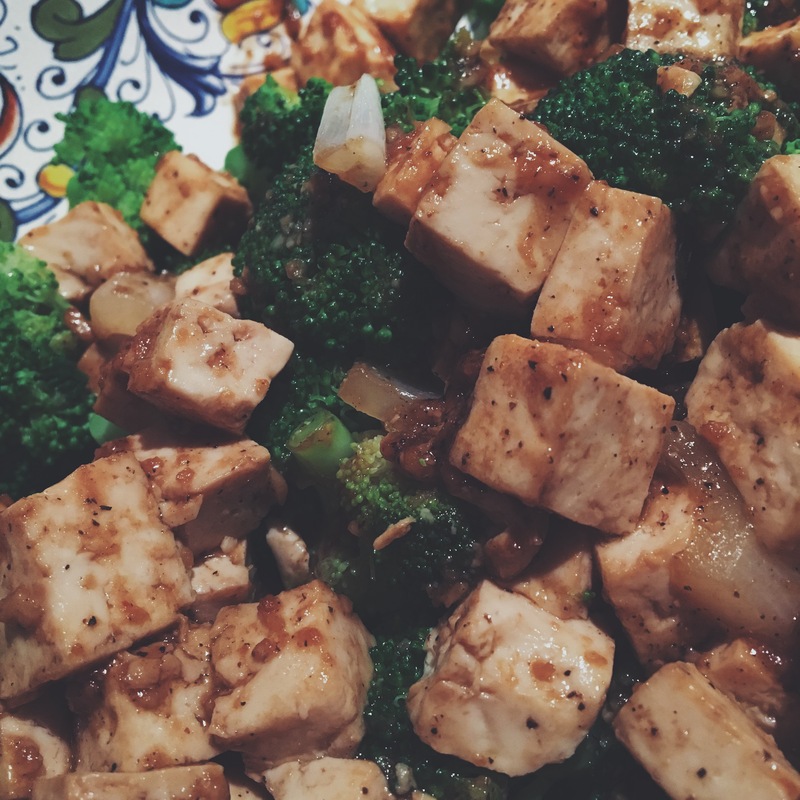 I love tofu so will have to try your version soon! I made this for a pot luck, and everyone immediately asked for the recipe. I am making it for the third time in a week, I’ve enjoyed it so much.